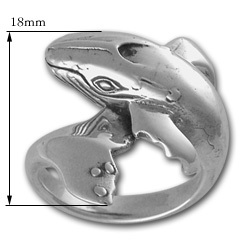 You'll make a huge fashion splash when you wear our exquisite Grey Whale Ring in Sterling Silver. Masterfully and delicately carved by Colorado artist Carson Dietz, it features a clever and unique wrap design that portrays the full body of a handsome, majestic, and intelligent grey whale with conscientious attention paid to its precise and lifelike tail, fin, and head detail. 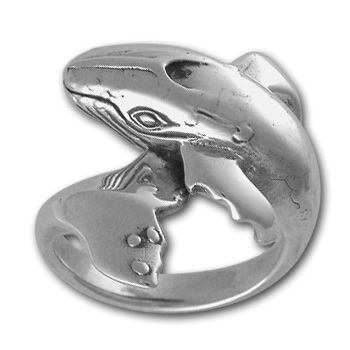 A gorgeous gift for your favorite marine mammal enthusiast or for yourself! QUALITY DETAILED BEAUTIFUL RING! I WAS VERY HAPPY WHEN I OPENED THE BOX AND SAW WHAT A BEAUTIFUL RING! I searched the internet for a whale ring, having just got back from Hawaii and seeing whales, and this ring was the cutest one I found. He has the best detail! From his blow hole, to his beautiful tale, to the way his eye is looking at you, he is the best!! I would recommend him to anyone. I was looking for a remembrance for my trip to Hawaii and I found it! This whole site has beautiful jewelry. Thank you! 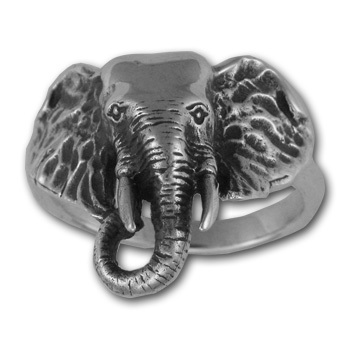 I bought this ring for my daughter's birthday to remind her of God's incredible wisdom and guidance in her life - Jonah and the Whale. I wanted a ring that was as unique and special in appearance as the meaning I wanted to convey. This ring more than lived up to that requirement. The quality and attention to detail was incredible. My daughter cried when she opened it, and in her words . . . "it's perfect, I love it". I also appreciated the personal service and help I received in shipping. I am very happy with this purchase. This is a really well-made, high-quality ring. 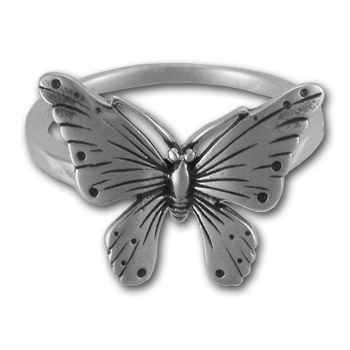 I love the design and the ring is very flattering to the finger. Fast delivery and good service as well.